When my dad, Peter's grampa, who was a carpenter for much of his working life, views our projects he shakes his head and comments how we tend to overbuild our projects. Because we build from steel as much as possible our projects have to be engineered. This means they are plenty strong. But we also have to satisfy our own design requirements. I hate failures. The way to avoid them is to over engineer. Often we add even more than the engineers request in critical areas. Decades of practical experience has taught us much. These structures need to survive moving around our shop, loading with cranes, transport, often many thousands of miles and then handling on site. All this happens before our projects are put into service. Then they have to perform as designed for decades under heavy use. When it came time to design the ship's roof for Hazelnut Inn we pulled out the stops. The design is complex with a variable pitch from front to back and will have a tall mast protruding. The truss assembly was built as per the engineers instructions. 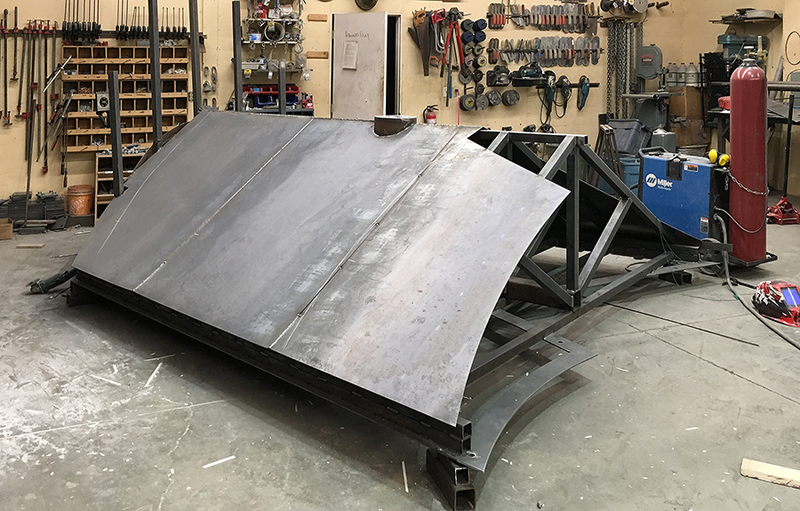 The welded steel roof is made from 1/8" thick 10 gauge steel. It will have channel iron ribs welded on every fourteen inches. We'll waterproof this top and bottom, inside and out for safe measure. It will get 4 inches of a closed cell spray foam inside as well for insulation. This roof won't leak. Ever. We guarantee it!